A growing number of people want products that match their values, including their love for animals. Many cosmetics and personal care products use animal-based components or are tested in animals, practices that conscious consumers are widely opposed to. To help consumers make purchases they can believe in, Leaping Bunny certifies cruelty-free cosmetics and personal care products that can wear their internationally recognized logo. By pledging support for cruelty-free products and entering in their big giveaway they’re having right now in conjunction with the popular beauty blog, My Beauty Bunny, you can win $1,000 worth of vegan Leaping Bunny certified products, and help them in their efforts to protect animals. Even if you are committed to buying products that avoid animal testing, knowing which products match your values can be difficult. There is no requirement for information about animal testing on labels, and statements about animal testing are sometimes deceptive, but Leaping Bunny makes information clear and easy to use. 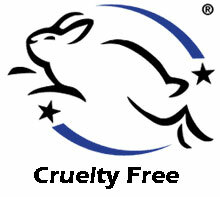 If a product carries the Leaping Bunny logo, you know that the product can be trusted to be cruelty-free. To be certified by the Leaping Bunny Program, companies must ensure that their products, and all of their ingredients and formulations, meet Leaping Bunny standards, as described on their site. Over 380 companies have joined so far, with more joining all the time. To see which companies are part of the Leaping Bunny program, you can consult their Compassionate Shopping Guide or their free handy iPhone or Android app. To encourage more people to get involved, Leaping Bunny and My Beauty Bunny are also working together on a giveaway through the month of September, collecting entries for someone to win over $1,000 worth of vegan, cruelty-free products. It’s a huge assortment, which can you see here: http://leapingbunny.org/giveaway.php The list of companies participating in the giveaway includes great brands like Urban Decay, Pangea Organics, Afterglow, Caudalie, and Hugo Naturals, among many others. To enter for the giveaway, you can earn entries by showing support for Leaping Bunny in several different ways, including taking the pledge to go cruelty-free, or following Leaping Bunny or My Beauty Bunny on Twitter or Facebook. Each action is worth a specified number of entries. For some actions like Tweeting about Leaping Bunny or sharing the contest on Facebook, you can earn entries daily. The deadline for entering the giveaway is September 30, 2011 so don’t wait – enter early and enter often. And don’t forget to look for the Leaping Bunny next time you’re shopping! The Coalition for Consumer Information on Cosmetics is composed of the following organizations: American Anti-Vivisection Society (Chair); American Humane Association; Animal Alliance of Canada; Beauty Without Cruelty, USA; Doris Day Animal League; MSPCA’s Center for Laboratory Animal Welfare; The Humane Society of Canada; The Humane Society of the United States; and the New England Anti-Vivisection Society. CCIC’s international partner is the European Coalition to End Animal Experiments. The website is www.LeapingBunny.org. Glenn Croston is the author of “75 Green Businesses” and “Starting Green”, helping businesses everywhere to do well by doing right.